i dig the pod (super hip lingo here). but find some decent cover art. instead of the stock nothing pic. Like the organization that produces it— FAIR (Fairness & Accuracy In Reporting)—CounterSpin challenges the bias of today's "corporate" media and brings perspectives to news stories that are rarely found in America's major media outlets. Janine Jackson is a thoughtful, articulate and intelligent host who leads accessible interviews with qualified subject matter experts on a variety of political, social justice and human rights issues few are brave enough to address with a broad worldview. CounterSpin isn't afraid to say--and let guests say--things that so many radio, tv and internet news shows avoid. There are some programs who simply use their bullypulpits to simply spew their own agendas or stick-to-the-script provided by their bosses. CounterSpin is refreshing in so many ways, not least of which is its respect for its audience; there's no "dumbing down" here, nor is there even a hint of stuffiness. I especially like that Jackson verifies facts presented in an episode and incorporate accurate media criticism into the discussion of the topic at hand, for how a story is presented determines how the public perceives the facts and their importance. Gives a good perspective on news and what the mainstream media is missing. Personally, I think some of the mainstream media is quite good and read a lot of it -- but it is still essential to be reminded that it definitely has biases and blind spots. Thanks to Adam and Nima at Citations Needed for pointing me toward this incredibly helpful, clear, and compelling show. As the extension of a more-important-than-ever enterprise, they provide a bracing and welcomed dose of reality without getting too deep in the weeds. Professional, prescient, powerful. The Antithesis of "Fake News"
This is primarily how I get my news! Very well researched and presented, the only thing I would change is the old school intro music and the title design so it looks more professional. You guys are incredible though, keep up the good work! I really love getting my dose of Counterspin after reading or hearing all the mainstream news during a week. I especially appreciate it when they bring up stories that the mainstream news lets slip through the cracks. Thanks Couterspin team! A corrective to the corporate media. Only half an hour a week, an amazing podcast. The weeks "news" analyzed for its propoganda angle. FAIR is a very critical part of what remains of investigative journalism in America. I listen to it every week, it is shocking what corporate media is doing to us. I learn so much for this podcast. I also enjoy reading their website and subscription newsletter. They strive to give a balance assessment of corporate spun news and special interest influence on my news consumption. A necessary check for avoiding the echo chamber syndrome, especially since I only have a limited number of hours to absorb all the different news viewpoints that potentially influence my thinking. This podcast hits the nail on the head for legitimate news that other outlets minimize or outright ignore because of their moneyed interests. We need more like this, this is the real news for the people. I've learned so much in listening to just 2 installments. I've already bookmarked fair.org and prwatch.org thanks to this podcast. Really enjoyed James Henry of Columbia University. Can't wait for the next installment. Thanks so much! They don’t let the mainstream “corporate” media get away with anything. Their bona fides as objective reviewers of the media would be more believable if they critiqued left-wing media. I follow all of FAIR Media Watch's stuff, and Counterspin is the first podcast I listen to when I'm working at my desk! This show does a great job of providing context to stories covered by the mainstream media. Much if the news today is little more than talking points from press releases with no scrutiny to the facts. This show takes its subjects to task both conservative and liberal. If you like this I suggest On The Media for a similar (albeit liberal) look at the news we consume. This show examines how the news is framed on both the left and the right. They are willing to go after the NY Times and NPR. I love it and I am firmly on the left. You must always be skeptical of corporate sponsored news sources, whether left of right politically. Fantastic program, Insightful and sharp, Counterspin exposes the fallacious arguments and bias of the corporate media. A must listen! Counterspin is one of my favorite podcasts. They focus on media coverage of a specific topic and have on a guest in the last ten minutes of the show. If you like to question your news source, this is an excellent choice. Seriously. This rocks. This is brought to us by the watchdog group 'Fair'. Its a brief blend of hard hitting precision and candor from contrast. They also have a great blog. I got gift subscriptions for friends and family that are less E-savvy. Facts (and ALL the facts) are facts. Glad there are podcasts like this one out there. The guest on healthcare was totally apolitical. She was speaking with a studied analysis and comparison of natl hcr to the ma program. The one on Afghanistan is informative as well. It's actually really good stuff. The mainstream media seems like a tabloid compared to this podcast. This podcast consists of, first: scathing reviews of our corporate media's sloppy reporting & rightwing slant, and second: an in-depth look at a current news story, with guests who are extremely knowledgeable on the subject at hand. I wish this podcast was more frequent than just once a week. Fairness and Accuracy in Reporting's Counterspin program is THE best source of mainstream media analysis. Cutting through media narratives that misinform the American Public every day, Counterspin asks the questions that should be asked and demonstrates what real journalism looks like. If you aren't listening to Counterspin, you are not informed. 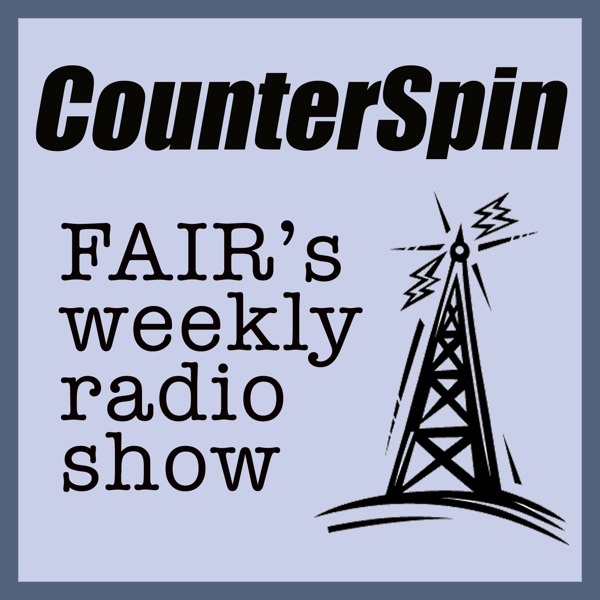 FAIR and its show Counterspin, heard weekly on Public Radio stations for years, is now also in podcast format. Same great show, same great content, but now you can listen at your convenience. Sort of like TiVO for radio. It's a great antidote to mainstream media, especially Faux News. Guests are usually informative and interesting. I've been a fan of the show for years, long before it was a podcast. It's difficult to find a more objective, better documented, more well reasoned analysis of media than is provided from FAIR. In fact I've not found it. I don't know if I wouldcall it that, but it is an interesting more liberal takeon the news media. Listen to this and some other news source boil it all down and I imagine you'll find some "unbiased" news. Top story of the day: dog does cute trick. Left out: what happens with your tax dollars, and what officials do in your name. Counterspin is a weekly broadcast by the media watchgroup FAIR [Fairness and Accuacy In Reporting]. Each week hosts offer a critical examination of what gets reported or not in the mainstream news. The show often includes a wide range of authoritative guests and/or empirical support for a more comprehensive look at current events, the public interest, and the role of the media. Not all viewpoints are equal in weight or size simply because they’re different. Because of the enormous effort it takes to refute a constant barrage of sound bite reporting, I’m giving Counterspin a five-star rating. The mainstream media reporting standard has been declining. Vital information is often left out, leaving readers and viewers in the dark, and it affects public discourse. Media have an obligation to inform the public about current events, and they often don’t. Counterspin has earned a right to illustrate the hypocrisy of mainstream reporting, often citing the media as the original souce of their quotes. Reasonable people cannot possibly formulate an accurate view or make informed choices about the world we live in with less. Dissection of news coverage....with attitude. I agree that CounterSpin has a snarky presentation which can get grating, however all news programs presented from left-of-center (US) news sources have this problem. Counterspin often covers (though briefly) topics not presented on Democracy Now (which over covers particular news stories at the expense of a broader perspective on the news). The focus here is on the spin that the mainstreem media places on the news items & so the attitude that the presenters have, while annoying at times, is somewhat apropos for what they are covering. I am a big lefty. I subscribe to FAIR and regularly participate in their "Action Alerts," but I cannot listen to CounterSpin. Every show and nearly every segment contains snarky/sarcastic commentary. It's grating. Stick to Democracy Now! and On The Media. Dizzy From All the Spin? Here's the Cure! CounterSpin's parent organization, Fairness and Accuracy In Reporting (FAIR) was founded in 1986 with a mission to expose bias and doublespeak in the media. CounterSpin is FAIR's voice on radio, and now in the podosphere. The show consists of weekly thirty-minute episodes dedicated to being a true "No-Spin Zone". Hosts Janine Jackson, Steve Rendall, and Peter Hart look at the corporate and independent news media with a critical eye and expose the funny business that is being passed off as real news. If you want to stop the spin, subscribe to CounterSpin today! Always concise, always professional, always insightful. A solid 30 minutes of fight-the-power subversive thought. Presented with class. Top-shelf. Support FAIR. Thank you. I'm always astounded by the detailed and lucid reports. I have listened to Counterspin for a long time on WBAI and am so glad for the podcast. If you want the facts...check it out!! !